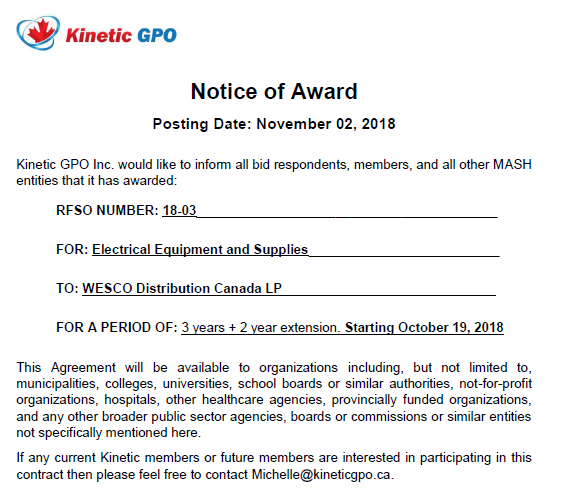 WESCO Distribution Canada LP is a leading provider of electrical, industrial, and communications maintenance, repair and operating ("MRO") and original equipment manufacturers ("OEM") product, construction materials, broadband cable, telecommunications, utility, safety and training solutions, advanced supply chain management and logistic services. Customers include commercial and industrial businesses, contractors, government agencies, institutions, telecommunications providers and utilities. In total, WESCO Canada is a network of approximately 105 branches in nine provinces. Branch operations are supported by four hybrid distribution centers located in Vancouver, Edmonton, Toronto and Montreal. WESCO focuses on helping customers lower supply chain costs, increase efficiency through WESCO Value Creation and save energy with green and sustainability initiatives.